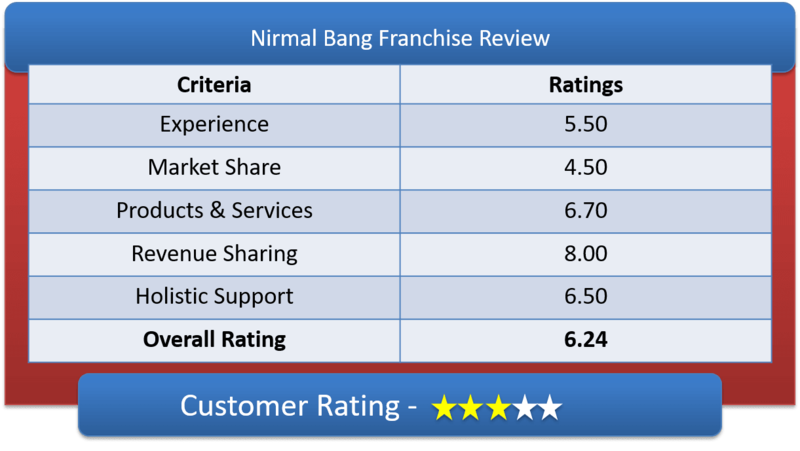 Nirmal Bang Franchise is one of the largest broking franchise in India. Nirmal Bang Franchise is a partnership format wherein one is required to have a certain level of experience in financial products as a broker/ sub-broker/remisier/distributor of mutual fund products or insurance products/Insurance Advisor/Financial planner or under employment of an existing broker of Nirmal Bang. One needs to have a decent capital to invest for building up infrastructure and hiring people – this capital may be a smaller amount initially and can be increased over a period of time as per the business needs. It also calls for a certain security deposit to be made with the franchiser. Nirmal Bang calls it partners as equal partner & provides similar treatment to them. The revenue sharing model works at 50-50 percentage sharing basis. It also varies from sub broker to sub broker depending on their minimum deposit commitment, volume of clients & brokerage. Like other stock broking franchise they also offer refundable minimum deposit programme where the sub broker wants to exit from being the franchisee of nirmal bang then they will get their entire minimum deposit amount refunded. Nirmal Bang Franchise format helps in incorporating the brand within ones infrastructure. It deploys an on-boarding manager who ensures that the staff is well trained and well educated about all the offerings and the tools that Nirmal Bang offers. It also helps in acquisition of new clients through a dedicated relationship manager. It also ensures that your personnel is well aware about the product offerings and is in a position to advise any customer on investment tips. It provides research support which helps to keep the staff updated with the market moves and also shares the anticipated moves and forecasts for advising the client base. A partnership set up can be ensured about having access to various modules, processes and other back end facilities for customer service support. It also provides access to analyse client reports. The product line that it offers is pretty vast – apart from regular stock instruments it also includes IPO and mutual funds and it is registered with NSE,BSE, NSE F&O, BSE F&O,NSEC ,MCXC , BSEC ,MCX, NCDEX, NSDL, CDSL. Nirmal Bang provides training programs for the sub broker & its employees. Training program includes end to end information related to stock broking sector & also regarding the trading platforms usage. It also provides advisory services on daily basis for absolutely free. They also have a dedicated sub broker support desk which provides all sorts of service support. They also provides online fund transfer facility to their sub broker & and also to the clients of sub broker. This is not a major service as most the stock broking franchiser provides this service now. I WANT TO TAKE SUB-BROKERSHIP/ PARTNER IN BHADRAK & NEED UR FULL SUPPORT. Please share you contact no. so that we can connect with you.